No flooring is more timeless and classic than hardwood. But just because it is classic doesn’t mean it’s only an option for a traditional, classic space. Hardwood floors create a beautiful backdrop for any style room – from rustic to modern. There are certain characteristics of hardwood floors that make them more suitable for one style or another. Before you choose the right hardwood for your home, here are a few basics to review. Ok, this doesn’t have much to do with the look of a floor but it’s good to understand the difference before your shop. Solid hardwood flooring is just what it sounds like. Each piece is a single piece of wood. It’s the simplest, purest form of hardwood flooring. It can be sanded and refinished to change the look without putting in a new floor. But, solid wood floors can be more expensive. Engineered hardwood is still made completely from wood. The difference is that it is constructed from three to five layers of wood laminated together with grains running at different angles. The top layer is the layer of wood that you see. Engineered hardwood floors are actually more structurally sound so they can actually be installed in areas where solid wood flooring might not be an options – like a moist basement. They’re also a bit less expensive. Now that we’ve have that out of the way, on to the visual stuff. Perhaps the most important indicators of how the floor looks are the species of wood and the stain color. First, the species. The species of the wood will determine the characteristics of the grain that you see through the stain as well as the performance of your floor (especially if it’s a solid wood floor). Let’s take a look at three of the most popular – Oak, Maple and Hickory. Oak is very hard and durable. It has a prominent grain so you will notice distinct markings and a wide variation in pattern from piece to piece. Oak is easily stained in many colors. Maple is not quite as hard as oak but still a great option for floors. Maple has a more even grain and it’s light color stains well. Hickory is one of the hardest and strongest woods. Hickory has a grain with a large contrast of light and dark colors. The grain will be very distinct especially with a light stain. Hardwood floor stain color can make a big impact on the look of your floor. Light stains and extremely dark stains tend to go well with more modern décor. Medium tones like honey and cherry work well with more traditional styles. Of course, there are always exceptions to these rules. To illustrate how much a stain can make a difference. The floors shown here are all the same wood with different stains. You can see the impact that hardwood floor colors have on the appearance of the floor. Check out more hardwood floor colors or stain colors – light, medium, and dark. Plank size refers to the width of each piece of wood in your floor. Plank sizes vary from 2-1/4” to 6” and wider. Narrow planks (or strips) tend to have a more traditional and formal look. They also can make a small room feel larger. Wider planks are a little more casual and rustic. If you’re looking to make a large space feel more intimate, wide planks may be right for you. These narrow plank floors go well with other traditional features of this kitchen. Photo: Carpet One Floor & Home. This kitchen shows off more rustic hardwood floors with wide planks. Photo: Rustic River Hardwood. Choosing a beveled edge floor means that the corners of each plan are cut at an angle. This means that when the planks are put together, you’ll have a small groove between each plank. A true beveled edge provides a deeper groove while an eased edge has just a small groove. Beveled edges disguise any unevenness in your floors. A distinct beveled edge gives the floor a more casual look. An eased edge is a bit more versatile. Photo: Carpet One Floor & Home. See more hardwood floors with a beveled edge. A square edge gives you a completely smooth surface. This creates a more contemporary look. A square edge can also look very formal. This one is pretty straight forward. Do you want your floors to have that shiny, wet look or something a little more matte? A shiny look will be more formal while less gloss tends to create a more casual look. 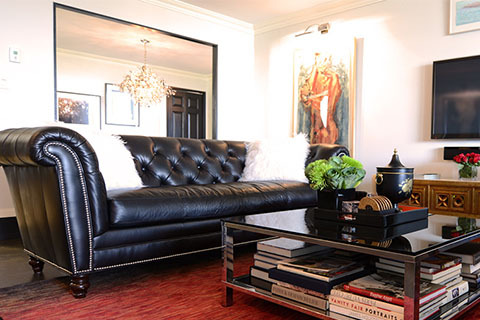 This high gloss floor fits well in a more traditional, formal living room. Photo: Carpet One Floor & Home. As you can see, there are so many different hardwood styles you can create with a beautiful hardwood floor as your base. 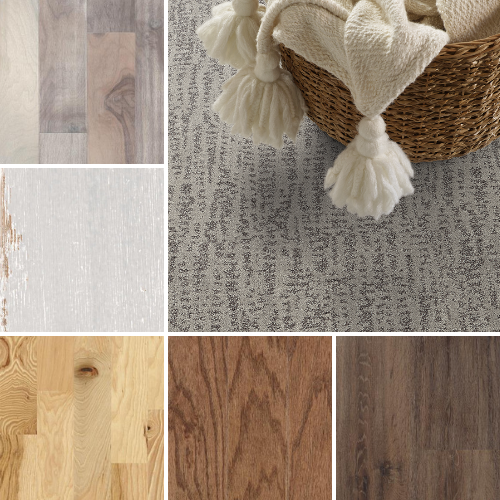 See more hardwood inspiration on Pinterest.